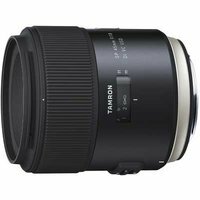 The Tamron 45mm f1.8 SP Di VC USD lens is a fast, fixed focal standard prime for full-frame and APS-C format DSLRs. The lens provides ultimate in functionality and operation thanks to its bright f/1.8 aperture together with Tamron's renowned VC (Vibration Compensation) Image Stabilisation system. The lens provides an equivalent focal length of 70mm on APS-C format DSLRs.